The City adage of “sell in May and go away; don’t come back ‘till St. Leger’s Day [October]” may have particular resonance this year; the SLI has fallen 12.7% since the end of May, wiping out all gains made since its low in March, thus ending with a net decrease of 31 % since its peak last June. 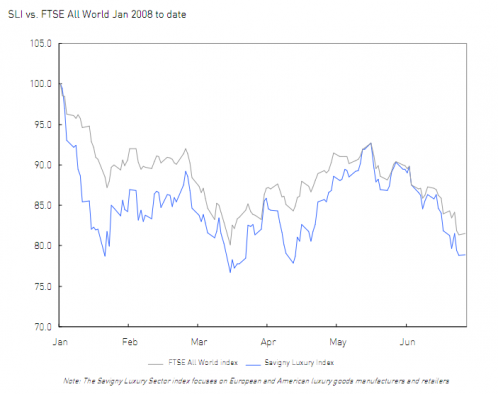 Although the SLI has pretty much tracked the FTSE All World Index since the beginning of March, it has been increasingly volatile, outperforming the index on the updside and underperforming on the downside, with stocks continuing to post daily fluctuations in the high single digits to low teens. Our message is the same as in our last newsletter published in March. If anything results announcements and market valuations since March have somewhat confirmed our view. Exposure to affordable luxury, be it through product focus or brand positioning, and exposure to the mature markets, in particular the U S and Japan spell doom and gloom as evidenced by the performance of Safilo, Lu xottica, Coach and Tod’s, which have all shown a decline in rating (EV/EBI TDA) of around the 50% mark since June 2007. Luxottica and Safilo have been particularly hard hit, given their exposure to eyewear and that the USA is the world’s largest market for eyewear, with ratings falling by 52 % and 54% respectively since June 2007. The only U S-heavy stock to have bucked this trend has been Ralph Lauren, which announced full year results significantly higher than market expectations, resulting in a 21% uplift in EBI TDA multiple since March; nevertheless the stock’s rating has still fallen by 22% since June 2007. Companies with strong brands, premium positioning, diversified geographic and product portfolios, notably exposure to BRIC countries (Brazil, Russia, India, China) have performed better. LVMH has maintained its rating since March, announcing strong Q1 sales figures, and Hermes has seen a 27% increase in its rating since March, buoyed in large part by bid speculation on the stock. 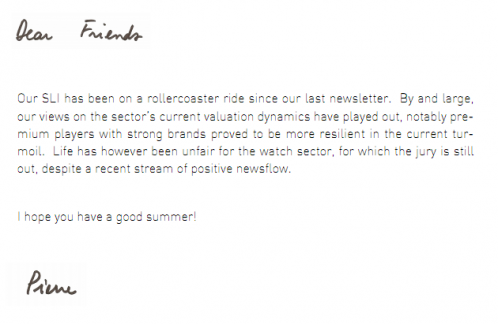 Whilst we believe there is still a mismatch between fundamentals and current valuations across the sector, the watch sector stands out as being particularly hard hit, despite mainly positive newsflow. Swatch posted results in line with expectations, yet saw its EBITDA multiple decline by 26% since March. 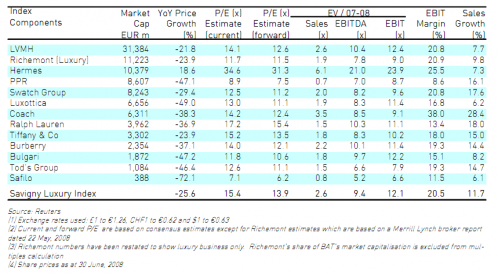 Richemont, which announced results ahead of expectations and confirmed its commitment to separate its BAT holding, witnessed a decline, albeit more modest, of 8% in its EBI TDA multiple since March. Both stocks now trade at around a 30% discount to their rating one year ago. Although there may have been concern over the sector outlook when the Swiss watch export statistics for March were released, these should have been appeased with the April statistics which underscored the sector’s resilience, underpinned in part by strong demand from high-end consumers in Asia, Russia and the Middle East. Nevertheless, the watch sector remains under a cloud, with no hard evidence to back a pessimist view; however a few of our contacts in the watch industry seem to be waiting for the other shoe to drop.